The first thing I did was to save his plan pages using the”save image as” function since the plans are not in a downloadable format. Once I had saved all the pages I imported the two plan pages into Matthias Wandel’s Big Print software. Since Mr. Cole drew his plans on a 1” grid is was easy to scale them up in Big Print. The next step was to print out the plans and make full scale templates of the pieces on hard board. I stacked two pieces of 21/32” by 4×8 sheets of OSB together, it took 2 1/2 sheets to complete the project, and then laid out all the pieces on the top sheet. 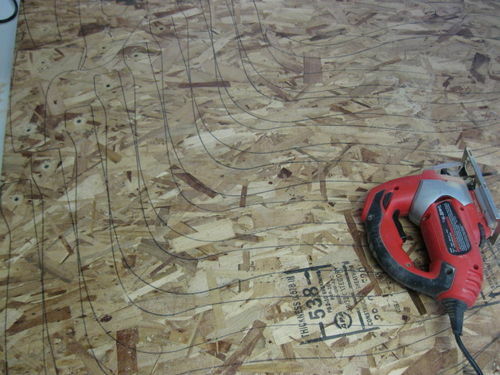 I fastened the two layers of OSB together by using two 1 1/4” sheet rock screws inside the layout of each piece. 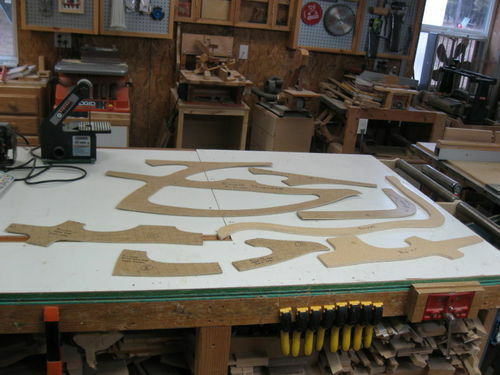 Then I began the task of rough cutting out all the pieces using my jig saw. 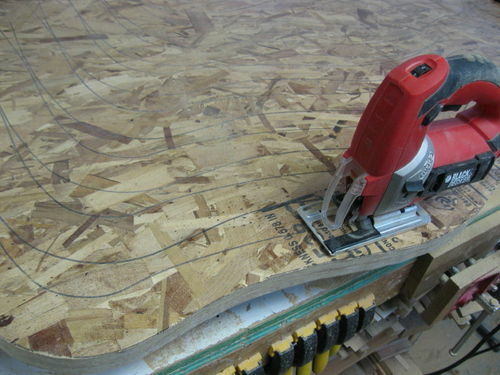 Once all the pieces were cut out I fastened the templates back on and took them over to my “homemade 16” bandsaw to final trim them to approximately 1/16” of the template. Leaving the templates in place I routed all the pieces to the templates using a 1 5/8” tall trim router bit. Did I mention the huge amounts of saw dust I created during this process. 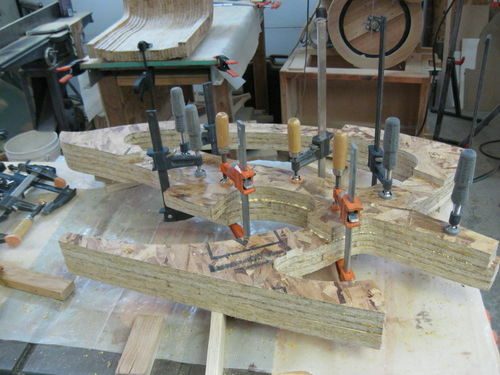 It was now time to glue up the pieces. I started with the seat. 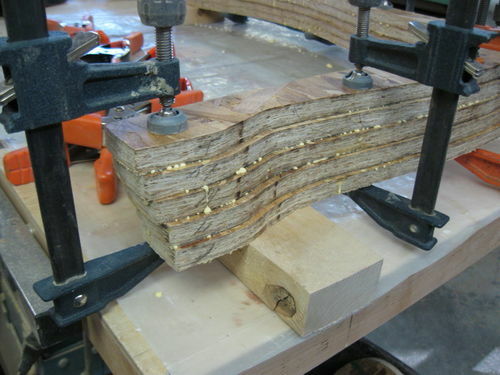 first I glued up the individual pieces into pairs. Then I glued up the pairs until I had 7 pairs glued together. this formed the seat bottom. 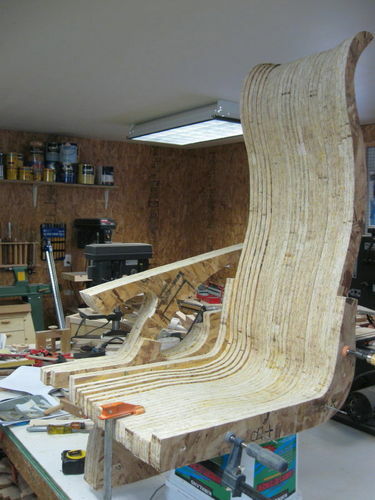 To form the wings of the seat and back I offset and glued five of the pieces on each side. the stagger was 1/8” forward and up on each of the five pieces. 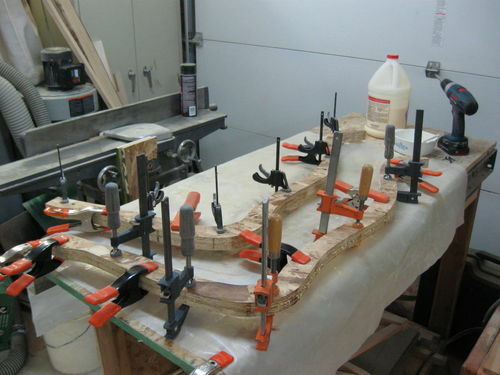 Once the two wings were glued up I attached them to the 7 pairs of the seat bottom. The next step was to glue a pair of what Mr. Cole calls “Small transitions” to each side of the wings. Now it was time to assemble the rocker sides. 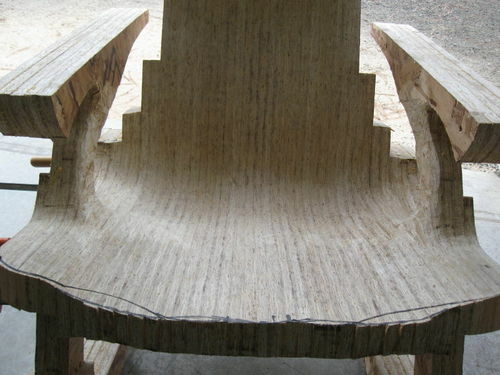 There are three layers of the rocker sides that form the core of this assembly and several smaller pieces called arm, side, front leg, and rear leg caps. 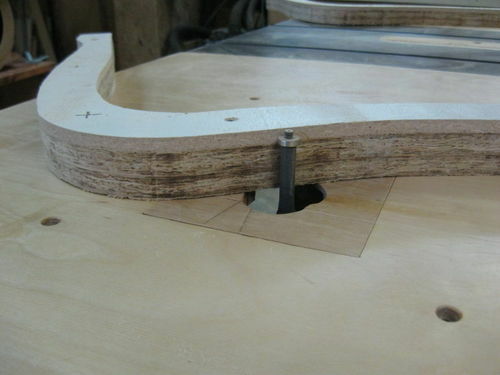 These pieces are added to provide sculpted contours to the sides. Transitions” Here is a photo of one side temporarily attached to the seat. 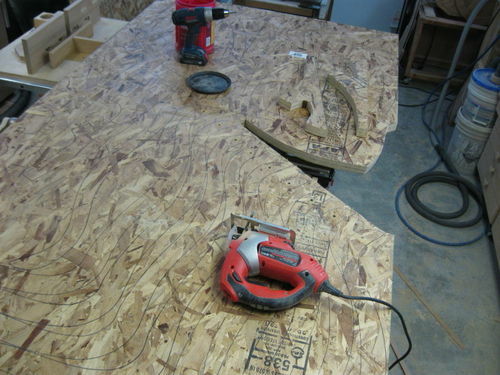 I should mention that there are alignment points laid out on his plans to help locate the balance point between the seat and the rocker sides. The second photo barely shows them with 16 penny nails sticking out of them. 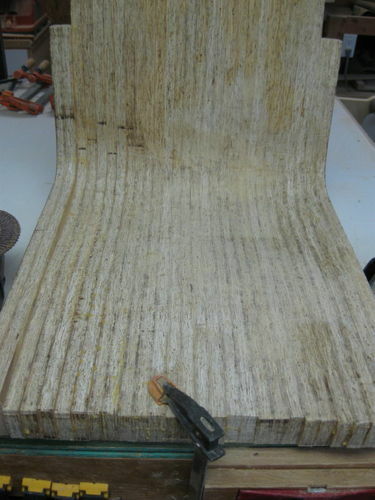 The nails are used as alignment pins between the seat assembly and the rocker assembly. 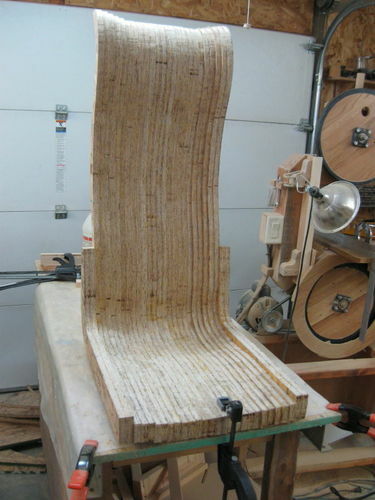 Now that both rocker sides are made and the balance points established it was time to start the sculpting process. I started with the seat assembly first. 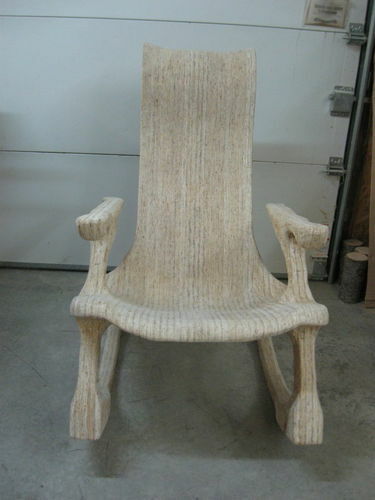 I did not attach the rocker assemblies to the seat until the sculpting was completed. 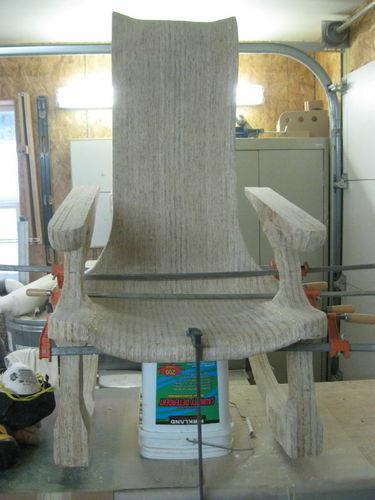 I sculpted the seat and the rockers with bar clamps holding the rocker sides to the seat. Well, I got caught up in the sculpting process I forgot to take pictures of every cut but I was finally finished blending the seat with the rocker sides so it was time to glue the three pieces together. 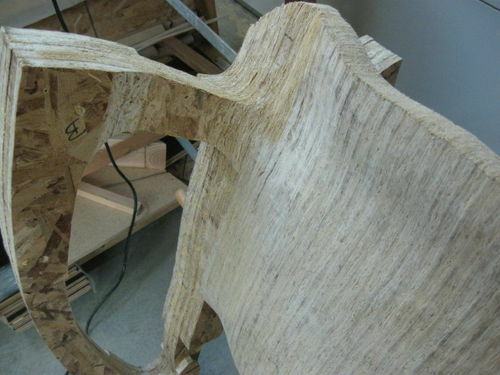 This was the first time the chair stood without clamps holding it together. 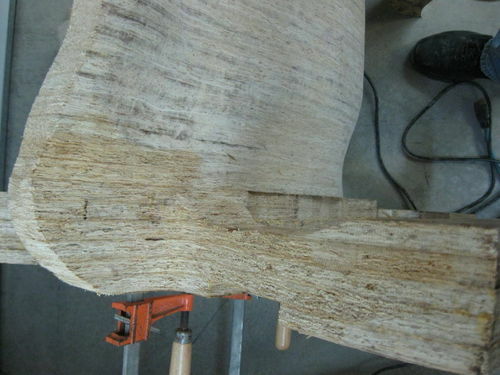 Now all was left was the sanding and finishing. I started this project on Jan. 11th of this year. It has been quite the experience to say the least. 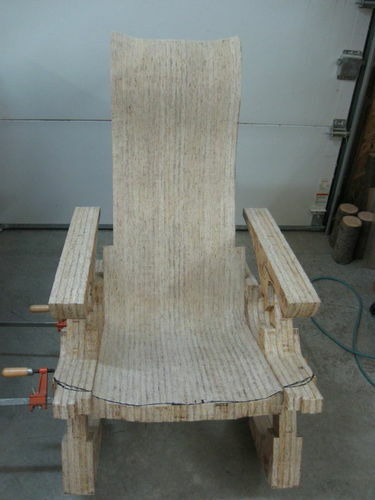 Now I have the confidence to build this chair out of real wood. Thanks for taking the time to read this blog. 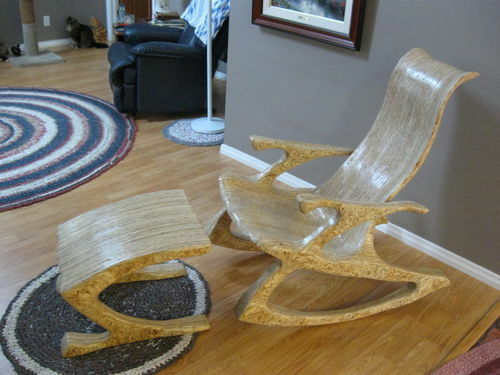 It is an awesome chair design, thanks Mr. Cole for sharing it with us. Wow, this is quite impressive. Being such a horribly porous material, how did you manage to get what looks like a smooth finish? I am quite in awe with your skills! Lee, this is one heck-of-a process. Wow! Really nice build tho. Hey Lee…. 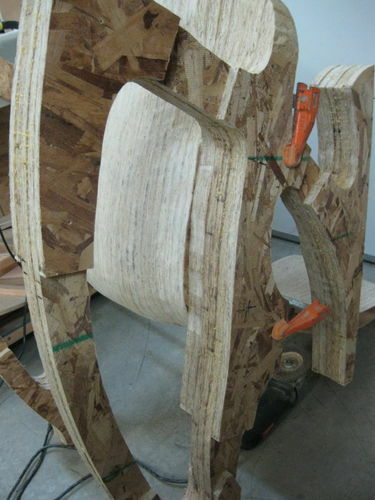 those look really cool, but I find myself getting OSB splinters just looking at the pictures! Also, the feet on the foot stool reminds me of the clod hoppers on my son when he was about 3 years old. Nitreug, OSB is very porous but with three coats of water based poly and sanding after each coat the finish came out OK. 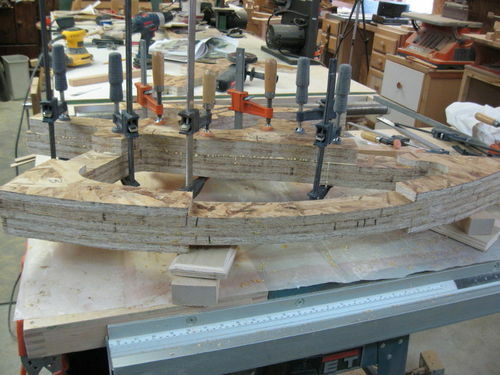 However, it is still rougher than if I had made this from real wood. Dallas, I just got two splinters during the whole process :-) The feet on the footstool kinda reminds me of frog legs :-). Very interesting process that obviously required a great amount of determination to bring to fruition. Congratulations on an ultra cool project and a great blog—thanks for sharing. Sam Maloof would have been in awe. Nice job! -- Lynn Bradford | Indiana | A poor excuse is better than none. 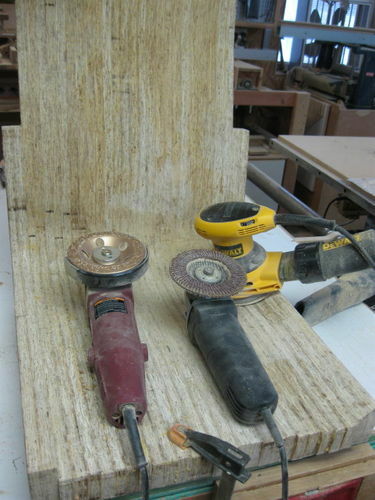 You are a talented and resourceful woodworker! 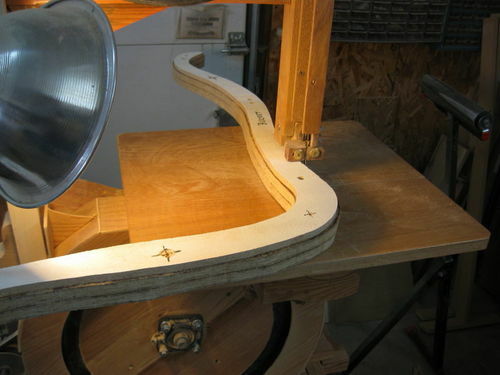 Your shop made bandsaw is likewise impressive. Thanks for doing the blog and posting the link to the plans. Just an awesome build. You should be proud. Very nice Lee. I can’t imagine the time and dust involved with that project. Well done. Can’t wait to see one you make from “real wood”. Very impressive Lee. The process looks simple and complex at the same time. Well done. Heck, I got dizzy looking at the first few pictures with all those lines. A lot of lead on this one. Thanks for putting this blog together. How heavy is the finished piece? And what wheels did you use on the angle grinders for the sculpting? 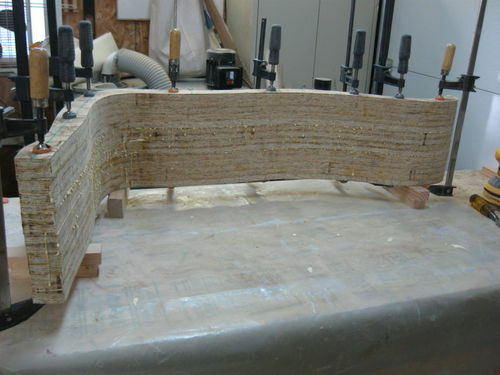 Do you intend to use solid wood for the follow-on project? 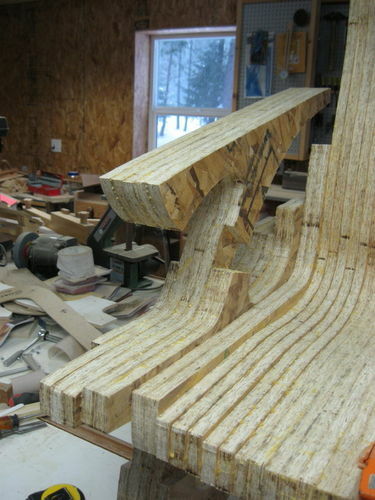 I kinda think baltic birch plywood would look cool. Gary, the chair weighs 57 lbs. and the stool weighs 26 lbs. I used a diamond impregnated 4” cup wheel and 4” 60 grit to 120 grit flap disc I found at Harbor Freight. A friend also loaned me his 4” cup shaped wheel called a Holy Galahad made by King Arther tools. 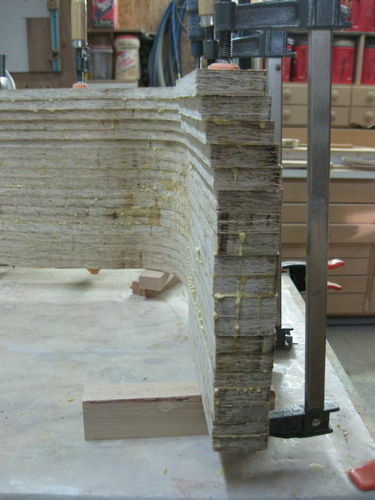 If you build one from baltic birch plan on buying 2 1/2 sheets of 3/4”x 4×8. Yes, I intend to build my next one out of red fir because I have a lot of it on our land.